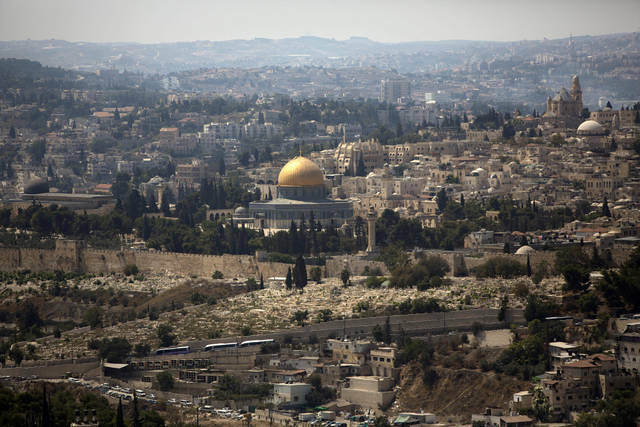 JERUSALEM (AP) — An Israeli plan to build a cable car to Jerusalem’s historic Old City has united architects and Palestinian activists in opposition to a project they say is both an eyesore and a ploy to entrench Israeli control over the city’s contested eastern sector. Developers say the proposed project is meant to relieve snarling traffic and will ferry some 3,000 tourists an hour from the western sector directly to the Old City, in east Jerusalem. It follows a series of Israeli projects in the combustible city that have enraged the Palestinians. Further complicating matters is the project’s association with the Elad Foundation, a group that has settled Jewish nationalists in the heart of Jerusalem’s Arab neighborhoods. The final cable car station will be integrated into a future tourist center run by the organization. Israel captured east Jerusalem, along with the limestone-walled Old City, in the 1967 Mideast war and later annexed it, a move never recognized internationally. The Palestinians claim the eastern sector as capital of a future state while Israel considers the entire city its eternal, undivided capital. The conflicting claims to east Jerusalem lie at the heart of the Israeli-Palestinian conflict and have frequently spilled over into violence. In recent years, Israel has carried out a series of initiatives, billed as development projects, that have infuriated the Palestinians. Israel built a light rail train through both parts of the city, abutting the Old City and snaking through predominantly Arab neighborhoods. The train is popular with Arabs and Jews, but it has also been the target of Palestinian rioters when tensions rise. Another proposed plan involves digging a railway tunnel under Jerusalem’s Old City, passing near sites holy to Jews, Christians and Muslims. The proposed line would end at the Western Wall, with a station named after President Donald Trump, who is cheered in Israel for having recognized Jerusalem as its capital. Beyond political opposition, the cable car has faced an outcry from urban planners and architects. No image says Jerusalem like the postcard view of its Old City — with its towering ancient walls, the Western Wall and the glimmering gold-topped Dome of the Rock. The cable car would run 1,400 meters (nearly one mile), launching from the First Station, a popular food and cultural center in west Jerusalem, sailing over the city’s ancient valley, stopping at Mount Zion, a hill just outside the Old City walls, and proceeding through the Palestinian neighborhood of Silwan before alighting at the tourist center. Aber Zayyad, a Palestinian resident of Silwan and director of its women’s community center, said she fears the cable car flying overhead will infringe on residents’ privacy and that its construction may harm houses and a local cemetery. The cable car’s destination at the tourist center has sparked concern about the project’s potential to serve settler interests by promoting Elad’s exclusive Jewish narrative of the city. “We believe that this is an attempt to change the character of the city and its face … its culture and identity,” said Adnan Husseini, the Palestinian minister of Jerusalem Affairs. Israel’s Tourism Ministry denies any political motivation. It says the cable car presents an environmentally friendly solution to the crisis of congestion, accessibility and parking at a time of record-breaking tourist visits. The Old City is Israel’s No. 1 tourist destination. Israel’s National Infrastructure Committee, which fast-tracks transportation projects of national importance, has given approval to the project. A building permit is to come after a 60-day period of public review — a step that developers believe will be a formality. In May, Israel allocated some $55 million to the project and, barring major complications, cars should be crisscrossing the valley by 2021, the Tourism Ministry said. Amir Halevi, the ministry’s director general, said he sympathizes with concerns about the sensitivity of the site but claimed that the rapidly rising tourism rates demand a dramatic response. Halevi added that the Ministry mapped the cable car route carefully to “minimize” the evacuation and demolition of buildings. He stressed the cable car would not enter the Old City or go over its walls, but would stop just outside. “We’re doing this to prevent the need to construct more invasive things,” he said. Urban planning experts disagree that the cable cars, which hold 10 people per carriage, will resolve the city’s daunting transportation problems. Salmah Milson Arad, director of the Jerusalem chapter of the Association of Architects and Urban Planners, estimated the cable cars will relieve only around 30 percent of bus traffic. Other critics have questioned whether the massive undertaking will even appeal to customers. Governments use taxes to do two things: raise revenue and alter people’s behavior. Taxing to raise revenue is painful, but necessary if we want government to do anything at all. Taxing to alter people’s behavior is more controversial. Sin taxes are aimed at reducing alcohol and tobacco consumption by making these things more expensive. In addition to paying for roads, gasoline taxes encourage people to drive less. Some jurisdictions even tax sugary drinks in the name of promoting healthier lifestyles. Most taxes both raise revenue and perform social engineering to some degree. There is one tax, though, that raises almost no revenue, yet encourages people to behave in counterproductive ways. It is the estate tax, better known as the “death tax.” Proponents dislike the nickname. But earning income triggers the income tax, and selling goods triggers the sales tax. Dying, not owning an estate, triggers this tax, so the nickname is more than appropriate. Because it generates less than 1 percent of all federal revenues, the death tax is easy to overlook, even for people who inexplicably find taxes interesting. In 2016, only 5,200 households paid it at all. That’s four-thousandths of 1 percent of U.S. households. Given the numbers, it is tempting to declare it No Big Deal and move on. But what makes the death tax dangerous isn’t the paltry revenue it generates, but the behavioral changes it elicits. When applied, the tax kicks into full gear at a whopping 40 percent, making it one of the most confiscatory taxes the federal government imposes. The apparent good news is that the death tax applies only to estates worth more than $11 million. The bad news is that the tax applies to the market value of assets, not merely to cash. And, where family businesses are concerned, that’s where the tax really does its damage. A family business can trigger the tax, not because it has millions in cash, but because it has millions in productive capital — real estate, machinery, vehicles, inventory and other assets the business needs to operate. Heirs who inherit a family business often don’t inherit enough cash, and so must sell off productive capital needed to operate the business so as to raise money to pay the tax. The effect on businesses whose owners have died is bad enough, but the effect on businesses whose owners are still alive is even more insidious. Consider a family business that made a $1 million profit this year. In many cases, the owner would invest that money back into the business, creating more jobs. But the threat of a 40 percent tax upon the owner’s death gives the owner an incentive not to invest in the business, but to withdraw the money from the business and spend it in other ways. This isn’t a hypothetical. In a study of 1,003 family businesses, more than one-third reported that paying the death tax would require liquidating all or part of their businesses. This study was conducted when the death tax exemption was lower. But today, there are between 10,000 and 40,000 family business owners who will likely trigger the death tax when they die. Together, they employ between 25 million and 30 million people. Applying that same one-third fraction to these means that the death tax currently threatens around 10 million U.S. jobs. No tax is popular with everyone, because every tax represents necessary tradeoffs between the good of individuals and the good of society at large. But of all the taxes governments impose, the death tax is the worst because it achieves almost nothing while imposing a tremendous cost. This was clearly not the intent of the law, but it is the reality. As luck would have it, there is a simple way to fix this problem: Eliminate the death tax entirely. Literally no one would ever miss it.